We are on an island, so you need some directions. Getting to Put in Bay is half the fun. Put-in-Bay Ohio is an island on Lake Erie about 5 miles from Catawba and Port Clinton. Two Ferry Boat Companies service Put in Bay Ohio. 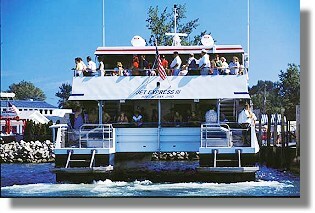 The Jet Express is a passenger only Ferry that leaves from Port Clinton and serves Put in Bay with 3 High Speed Boats. The Jet Express drops you off in Downtown Put-in-Bay. 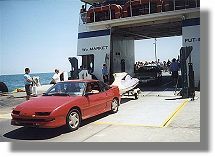 The Miller Ferry leaves from Catawba and has 5 Passenger/motor vehicle Ferries that service Put-in-Bay and Middle Bass Island. 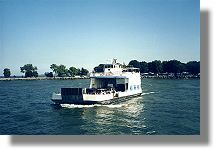 The Miller Ferry drops passengers off on the South shore of Put-in-Bay where Taxi's, Buses, and golf Carts are available for the short trip downtown. Getting Here is half the fun! Put-in-Bay is the crown Jewel of the Ohio Lake Erie Islands. The Official name of the Island is South Bass Island but it is better known as Put-in-Bay Ohio, Lake Erie's Fun Spot. Over a half a million people visit Put in Bay every year. The Bars, restaurants, attractions, hotels, cottages, cabins, home rentals, boaters all combine to make Put-in-Bay a unique travel destination. Nicknamed the Key West of the North, Put in Bay OH lives up to its reputation. For driving directions to Put in Bay Ohio click one the driving directions to the Miller Ferry and the Jet Express and enter your address the page will default to the ferry dock. See you at the Bay... Put in Bay Ohio. The Fastest Way To Put-In-Bay! The Jet Express is a safe, ocean approved catamaran offering passengers a choice of all-weather protected, indoor seating or a refreshing open air ride. Traveling at speeds of more than 40 mph, it offers the smoothest, fastest ride across Lake Erie to Put in Bay Island. On your way you'll pass seven Lake Erie Islands, catch up on Lake Erie and South Bass Island History and travel shore-to-shore from Port Clinton to Downtown Put-in-Bay Ohio. 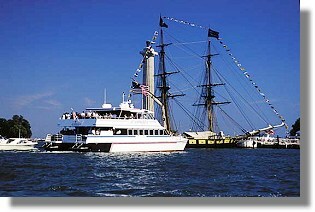 Lake Erie's most popular Ohio island destination and family fun spot. Take the Jet-Express to Put in Bay Ohio and visit this beautiful Ohio Resort. Put-in-Bay Ohio & Middle Bass Island, resort islands of Lake Erie, are known for their beauty and historic charm. Both islands are easily reached by the Miller Ferries which run daily trips from Catawba, halfway between Toledo and Cleveland. A visit to these islands allows you to live an unhurried pace, feel the fresh lake breezes, delight in spectacular sunsets with crystal clear skies and casual surroundings. Discover attractions, shopping, entertainment, lodgings, tours, special events, dining, birding, and more. Explore this site, give us a call for more information, then plan your getaway aboard a Miller Ferry.